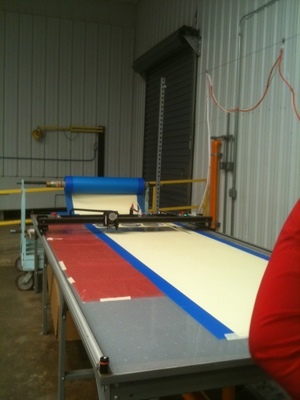 Aerojet’s Camden facility is using our plotter/cutter to mark and cut insulation for the Guided MLRS rocket! In February 2011 we installed and trained the crew of SH2-10 for 4 days to operate and service a turnkey Carlson Design cutting system. Cutting by hand, an Aerojet trained cutting tech can cut a complete single rocket set in 17 minutes. This time does not include material layup, part labeling, or post slitting — where they make 10-15 additional 4″ shallow arc cuts in 6 of the 18 parts. Using a Carlson Design PT-60″ riding on a 12′ long table, they can now cut an entire single rocket set in 6 minutes. 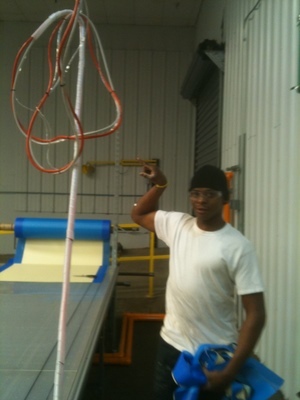 This includes layup, marking each part with a part number, and slitting. Cutter in action plotting/cutting rocket insulation. We cut 3 miles in the first 4 days! The parts are now much more precise and extremely repeatable. No more $160 pair of scissors, no more digging through trash piles to maximize material yield, no more wear-and-tear on personnel, no more difference in part quality between different “Cutters”. During training, another department visited to see if they could use our cutter to replace their large format die cutters. After a successful first test the verdict was in: the Carlson Design cutter cut their insulation faster, with less waste, with a better quality cut, and everyone agreed it was “much safer”. Naturally, being a rocket manufacturer, Aerojet is a stickler for safety and protocol. When we arrived, we received a safety briefing with instruction to wear steel toe shoes and eye glasses at all time, and no lighters or matches allowed! To complete our system setup, they need to approve the equipment and write a “first article” defining operating procedure and product quality. To do this, a meeting was called for a process engineer, quality control engineer, manufacturing manager, CAD designer, safety engineer, machine operator, manufacturing supervisor, electronic technician, and all the rooms cutters — 13 people in total. Our system passed this rigorous inspection with flying colors. Now some pictures showing the install — for security purposes we could only photograph the area around the table. Two 5HP regenerative blowers mounted outside and plumbed in. To secure Aerojet’s material during cutting, the installed 2 large, 5HP regenerative blowers. 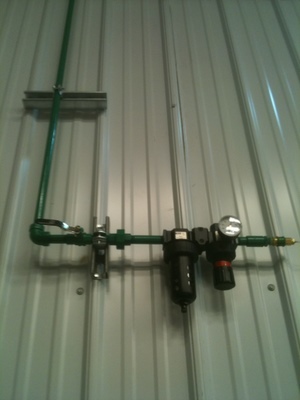 These can be plumbed individually or in series. Mounting them outside the building makes for a quite work environment. 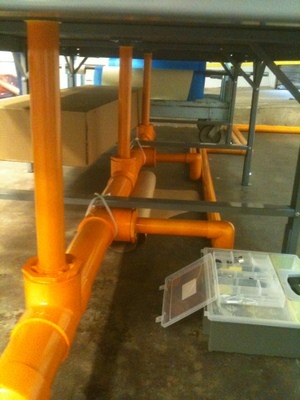 They used PVC plumbing to accommodate the large vacuum produced by the regenerative blowers. 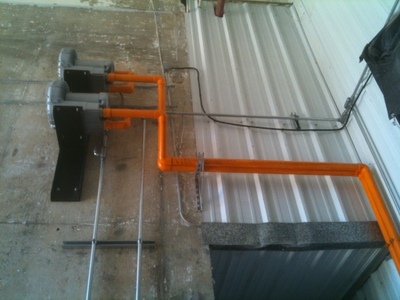 Painted orange, the plumbing is easy to see to prevent tripping or damaging when working under the table. If you keep the plumbing off the floor by connecting it to your table frame, try to support it from beneath in a few places to prevent it from causing your table to sag over the years. Blower On/Off switches -- wired independently. The regenerative blowers use 3 phase power. It is important to wire the on/off switches near the operator’s workstation. The operator will turn the blowers on and off at the beginning and end of each cut. 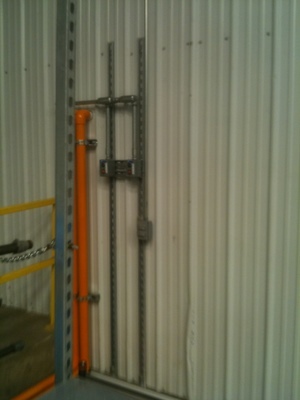 Pneumatic water separator - keeps air dry in humid Arkansas summer! Cory using our convenient rolling operator's workstation. The Carlson Design operator’s workstation is a convenient way to introduce a tangle free computer/monitor/keyboard/mouse into the work area near the plotter. This “Stand-up” model is ideal for a production environment — if you are designing at your plotter computer, we recommend a “Sit-down” operator’s station. As always, you are no required to purchase our stand. 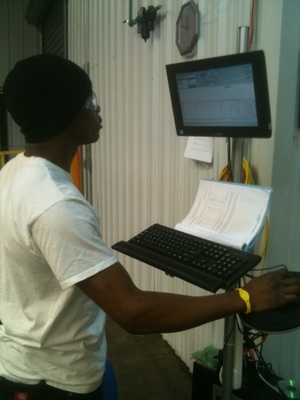 Here, the machine’s operator Cory is previewing a plot file before hitting “GO”. Cory points out the easy-run overhead cabling. Simple and clean. Easy to change cables. Few moving parts. Using two shelving brackets mounted on either side of the table, they created an easy way to mount their overhead cabling. 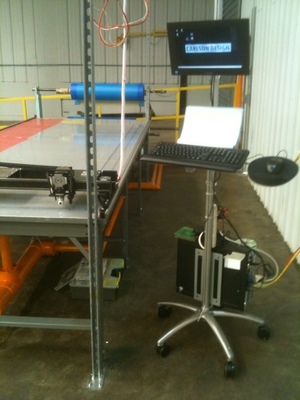 The cables attach to one pulley per 5′ of table. Cables are zip-tied together for a clean appearance, although they are still very easy to change if necessary. 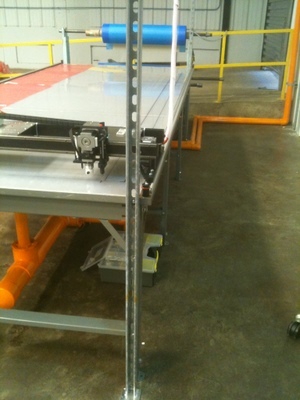 PT-60 plotter/cutter on 12' long vacuum table. Boss man Robin Goodwin and operator's Cory and Peggy take a final picture with Tom before saying goodbye. Install and training success! Many thanks to Rickey Posey, Robin Goodwin, Jeff Price, Lynne Gaston, Kay, Cory, Peggy, and everyone else who helped make this a great install!